I was first exposed to the long-running radio program Vic and Sade, not through radio, but through television. While watching an episode of the Colgate Comedy Hour, a live television program from the early fifties, I noticed a cast of unknowns performing the roles of a family who lived "halfway up the next block" and a brief announcement that Vic and Sade had been done prior on radio. About that time, Radio Spirits released a bookshelf album of audio cassettes for Vic and Sade and my curiosity was piqued so I bought the set. It took a bit of adjustment to understand the formula of the radio comedy -- a style of wit that doesn't always agree with everyone -- especially those who expect insults and slapstick. Vic and Sade is an acquired taste and the more you listen to them, the more you grow fond of it. Flash forward a year or two later when, at REPS in Seattle, I met a couple people who were fanatics for the radio program and there I was exposed to the legend and lore of Vic and Sade. Half of what was told to me went in one ear and out the other -- dirty gossip and stories about hoarders -- but the gist was clear: there were recordings of Vic and Sade (and radio scripts) that were being hoarded and regarded as national treasures. "Why are they not available to fans in the hobby?" I asked. The reasons varied and I simply let things go as they are. Half the fun of collecting old radio programs was seeking out recordings I did not have in my collection. I would continue to seek copies from various collectors. To date, I have over 400 radio scripts and almost as many radio programs in my collection -- enough to last me another decade of enjoyment before I exhaust my collection. Just recently McFarland mailed me a complimentary copy of John T. Hetherington's new book, Vic and Sade: A Cultural History of Paul Rhymer's Daytime Series, 1932-1944. The subtitle pretty much sums up the book. Growing from his love for Vic and Sade, the author explores some of the deeper meanings and themes beneath the absurdity and humor. A brief biography about Paul Rhymer and the origin and early years of Vic and Sade are included within the pages. A study of mass culture during the 1930s and 1940s and how it influenced the characters on Vic and Sade, is explored in detail. A history of motion-pictures during the era, reading on the porch, community service and other aspects are explored as they relate to the radio program. The closing chapter covers an aspect of the series that has been undocumented in prior publications: the later efforts to revive the series -- including the Colgate Comedy Hour. This book features a history of the radio program, but only interlaced throughout the book, sprinkled with excerpts of script reprints. There is no episode guide or chronological documentation with a date-by-date broadcast schedule (network, broadcast time, cast changes, etc.). I know that would be a major challenge to the author, but since so many radio scripts and recordings exist in collector hands, I would assume taking on such a challenge would be both exhausting and rewarding. Such efforts would overshadow others such as the late Bill Idelson, a cast member, who wrote The Story of Vic and Sade in 2007 for Bear Manor Media, and a book of scripts published prior. If what you are seeking is a "cultural history," in what many describe as a "critical analysis," which McFarland statistically publishes more of every year, or want to explore the program deeper than it has ever been explored, this is a great book. If you are looking for a historical perspective of documentary nature, covering minute details ranging from the sale of screen rights, salary costs and exclusive memories and recollections from cast and crew, this is not the book. One such example: pages 106 to 108 are devoted to the history of motion-pictures and the industry of Hollywood. Vic and Sade is referenced on page 109. And the two photographs on page 108 and 109 are of old movie palaces and theaters from 1935 and 1939 -- and have nothing to do with the radio program Vic and Sade. I only criticize (briefly) because the title of the book is Vic and Sade on Radio. Still, if you are a fan of Vic and Sade, this is a book for you to take to the beach and enjoy. Billed as "The First Lady of the Tarzan Films," Enid Markey had a career spanning over six decades. From the silent days of the silver screen, to Broadway and the legitimate theatre, to television and radio... this book features an extensive biography about the actress and documents every facet of her acting career. 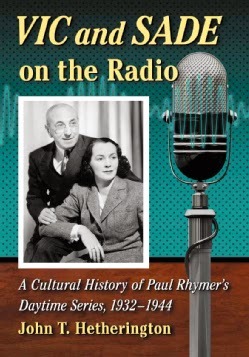 As a fan of old-time radio, it is a treat to see radio broadcasts documented in a book that isn't primarily focused on radio... and suggests the author did his research. There are more than 300 photographs in this book, reprints of newspaper clippings, studio publicity photos, press books and much more. Brian Bohnett, the author, is an active member of the Greater West Bloomfield Historical Society, and also a member of the Burroughs Bibliophiles -- an organization which awarded him the Edgar Rice Burroughs Achievement Award in 2003 for his work in writing and publishing. A graphic designer and illustrator by trade, Brian took to self-publishing this book under his Mad Kings Publishing label. As a result, this book is not widely available through the major circuits. You pretty much have to seek out across the internet to find and purchase a copy of the book. I was told the copy sent to me was among the last in stock so by the time you read this, the book may already be out of print. But do not hesitate seeking it out. A couple years ago I met a man who once expressed displeasure in purchasing any books self-published because, as he believed, this meant the book was never worthy enough for a major publishing house to consider snatching it up. This is a misconception as I find many self-published reference guides are better than the ones that are published from a major house. It all depends on the author of that book. 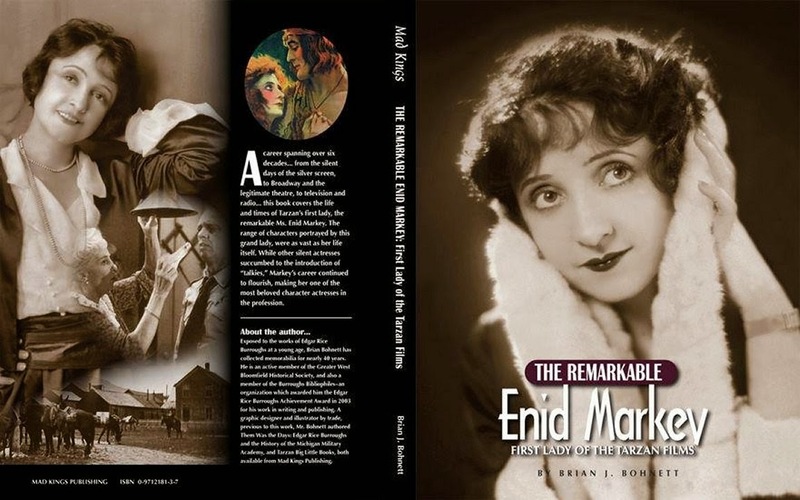 My only regret is that books on other silent screen actors and actresses have never received such extensive coverage as Enid Markey received. Great job, Brian!